And once again I’m saved by the miracle of… lasagne! 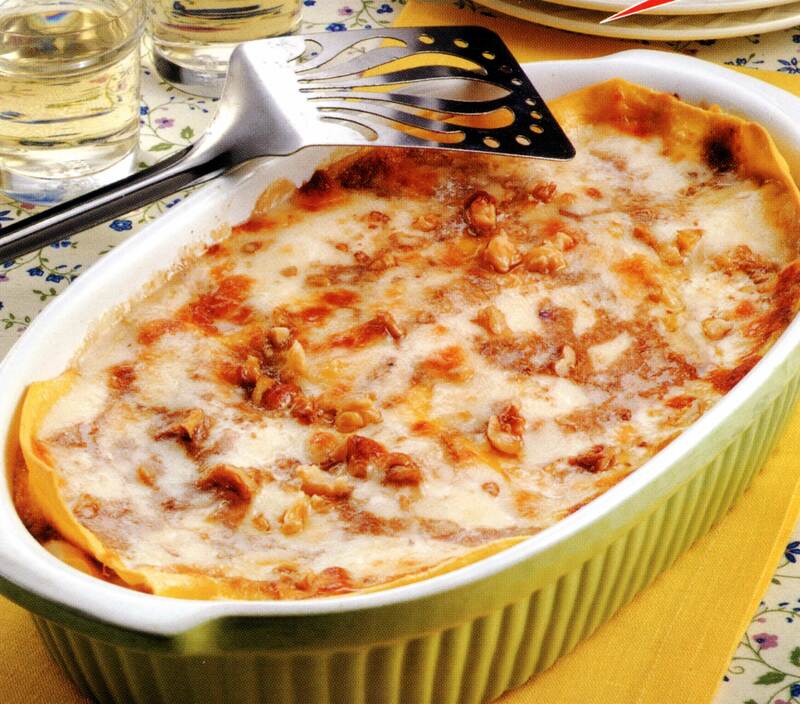 The original lasagne (“alla Bolognese”) uses only Parmigiano Reggiano, Bolognese sauce and nutmeg flavored béchamel sauce (besciamella). Today, there are hundreds of lasagne variants, from artichoke spinach lasagne to spicy chipotle lasagne to vegetarian and seafood versions. The dish lends itself to creative use of ingredients by home cooks as well as chefs. Although the dish is generally believed to have originated in Italy, the word “lasagna” comes from the Greek lasana or lasanon meaning “trivet or stand for a pot”, “chamber pot”. The Romans borrowed the word as “lasanum”, in Latin, meaning “cooking pot”. The Italians used the word to refer to the dish in which lasagna is made. It wasn’t long before the name of the food took on the name of the serving dish, same as it happened in the previous chapter with paella and the paellera. The key in making good lasagne is the meat sauce. The secret is in slow simmering. It might get as long as six hours, but on the other hand the hard work will be done in 30-45 minutes. The other thing are the ingredients: the quality of the meat determines the quality of the souce. It is better to cook larger quantities: grab 600g of minced beef (assuming you trust your butcher, that is, or mince it yourself as I do), 200g of italian sausage and 100g of pancetta or lard in very small cubes and no less than 1.5kg of ripe tomatoes. The excess could be refigerated easily – the souse is acctualy even better next day. Start with tomatoes first. Get a pan with boiling water and a bowl with cold/iced water, cut a cross over the tomatoes, and poach them in the boiling water for no more than a minute. Throw them in the cold water and watch the skin fall apart. Peel the tomatoes, cut them in four and throw the seeds away. Sprinkle some salt on the clean tomato quarters and put them in a drainer for twenty minutes. You will be amazed to see how much water the tomatoes will lose. after a couple of hours, add a good glass of milk as the perfect finishing touch to your meat sauce. Taste and season with salt and pepper. Meanwhile, to make the white sauce, combine the milk, parsley stalks, peppercorns, cloves and bay leaves in a medium saucepan and bring to a simmer over medium heat. Remove from heat and set aside for 15 minutes to infuse. A couple of hours before the meat sauce is ready, it’s time to think about pasta: make a dough with 1LB of white flour, four eggs and a good pinch of salt. Add 1 Tbsp water at a time, if needed. Work with the palm of your hand until it is elastic (a few mns). Wrap in plastic and let rest for 30 mns to 1 hour minimum. then use the rolling pin or a pasta machine to end up with thin, large, squares which if at all possible should be the size as the pan they’ll be ending up in a short while (this pasta shape is what we call lasagne, by the way). Let the pasta sit for a while, and bring some salted water to boil. Get a bowl with cold water and bring it near the stove. Add a drizzle of oil to the boiling water, and poach no more than two lasagne at the same time, or they will horribly stick together no matter the oil. Let them cook for a little more than a minute, then throw the lasagne in the cold water bowl to stop them from overcooking. Preheat oven to 350 F. Brush a rectangular 3L (12 cup) capacity ovenproof dish with oil to lightly grease. Spread one-quarter of the bechamel sauce over the base of the prepared dish. Arrange 1 lasagne sheet over the sauce. Top with one-third of the mince mixture and one-third of the remaining bechamel sauce. Continue layering with the remaining lasagne sheets, mince mixture and bechamel. Finish your pan with the two sauces and a very generous handful of parmesan which will melt and form a great crust. Some 30 minutes before you want to eat, turn the oven on to 350 F and whack everything in. Finish with some grill. Remove from oven and set aside for 10 minutes to set.